Fruit'Elite püree "Geschmack der Jahreszeit"
The Jamun, also known as the Java Plum or Jamelon is the fruit of the Jamelon tree, native to Southeast Asia. 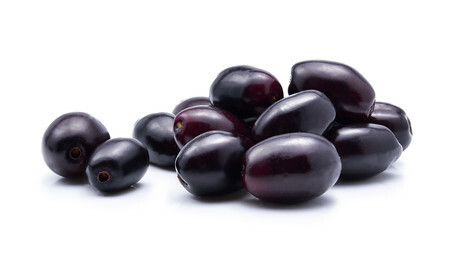 These little olive-shaped fruits are green when immature and change in color as they ripen from pink to a dark glossy deep-purplish black when fully ripe. The flesh is also purple and is sweet to the taste with just a touch of astringency. The fruit is used in jams and jellies, fruit juice, tarts and sorbets. In some countries the Java prune is also the base for a wine with flavors reminiscent of port. The fruit is rich in vitamins A and C, and our Fruit’Purée Java Plum with no sugar added to those naturally present in the fruit offers you the same health benefits as the fresh fruit and will be a new ally in your search for innovative recipes. The product is offered in 1 kg pots, packed in cartons of two pots.